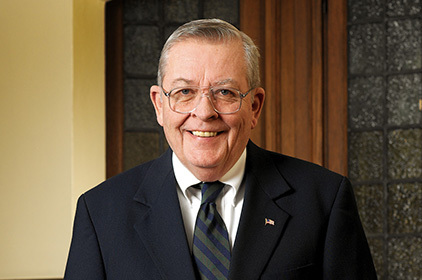 The Homer Laughlin China Company invites the foodservice industry to say goodbye to its former president and CEO, and, most recently, chairman of the board, Joseph M. Wells III, who passed away March 12, 2019 at the age of 77. Wells began his career at The Homer Laughlin China Company as a part-time worker in high school and college, starting full-time in 1963. He worked his way up to the sales department and then succeeded his father as executive vice president and general manager in 1986. In June 2002, he became CEO and president of the company. In 2013, he retired and became chairman of the board of directors. Wells was always quick to credit Homer Laughlin’s success to its employees and past generations of leaders. However, he took his rightful place alongside those leaders in leaving a legacy of vision and success. Under Wells’ tenure, the company modernized its production facilities and decorating processes with state-of-the-art equipment to ensure high quality and efficiency. He helped expand the supremely popular Fiesta® line, enhancing its worldwide reputation as a favorite of collectors. Finally, in 2010 he oversaw the acquisition of Hall China, a chinaware manufacturer founded in 1904 and headquartered in his hometown of East Liverpool, Ohio. Perhaps most importantly, Wells was determined to keep the company’s jobs in the U.S., despite industry trends to move manufacturing overseas. As a lifelong resident of the area, he was dedicated to growing his community by offering good-paying manufacturing jobs in his hometown. Joe was born in East Liverpool, Ohio, and raised in Newell, West Virginia, home of HLC’s headquarters. The two towns sit opposite each other, separated only by the Ohio River. And both of these river towns — and many in the foodservice industry — lost a friend in Joe Wells.